BRAND NEW, SHRINKWRAPPED current 20th Ed. Bluebooks, SHIP SAME BUSINESS DAY! 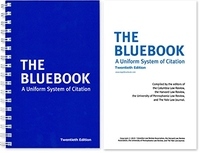 We've sold 400,000+ Bluebooks since 1999 and have thousands of happy customers. Hundreds of copies ready to ship! Choose Expedited Shipping (2-4 business day delivery) for fastest shipping time. We represent the Internet's largest independent legal bookstore!